With the ever growing requirement to maximise the space in your warehouse, more and more companies are looking to Double Deep Pallet Racking. Using the simplest means of racking Selective Pallet Racking you are able to maximise the space in your warehouse. Double Deep Pallet Racking is a dense configuration of Selective Pallet Racking. Using two bays or racking back to back connected with special guide rails or mesh decks to make each level hold four pallet positions. Great for warehouses with fast moving inventory. Low SKU but high volume and perfect for Last in First Out warehouses. Double Deep Pallet Racking is quickly becoming the choice for many. If you are interested in buying Used Double Deep Pallet Racking, want to know more or just wanted to see if this was a possibility for your warehouse, then give us a call or get in touch using our contacts form on the “Contact” page. 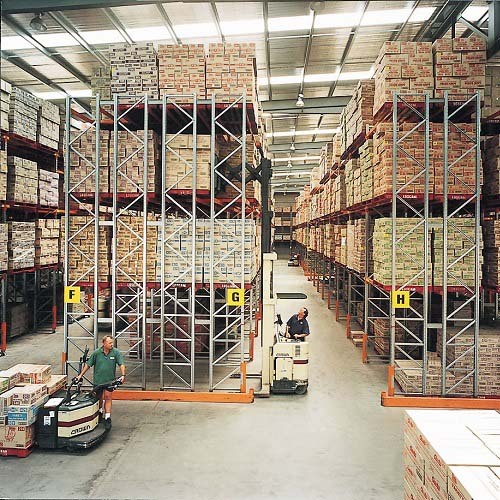 Ware Hows – leading supplier of Used Double Deep Pallet Racking to businesses throughout Brisbane and Australia wide.